The Short and the Sweet of It: Whimsical Jewerly. Check. 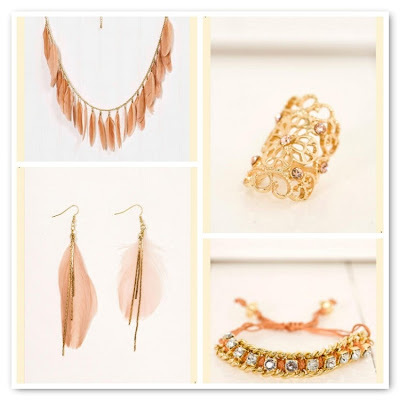 Darlings...aren't you in love with the blush and gold fluttery accessories from Francesca's? I'm thinking I would pair these with a short, cream colored cocktail dress with lots of ruffles. What about you? That feathery necklace is beyond gorgeous - love these pieces! I love these neutral colors. Always love seeing other jewelry designs! Lovely detail and color. How gorgeous-I can't resist a bit of gold! these are really cute! love the bracelet! I always beeline for their store in the Carlsbad Forum. How did I not know that they have a website?! You know I loved myself some gold, GREAT accessories! Have a lovely day! all of the pieces are so sweet! Gorgeous - love that filigree ring! Totally my style, so pretty. Love Francesca's. Their accessories are so amazing. That necklace is really gorgeous!